There are some places you go in your travels where everything kind of seems just right. It can be anywhere - sitting on a deck with friends at a cottage, at the ballpark or other sporting event, hiking through a wooded trail. Sometimes it doesn't even have to be a physical place; watching the "catch"scene in Field of Dreams brings me immediately into my backyard as a ten year old with my dad. When I walked into Keeneland for the first time I felt that way about a racetrack. It was just so welcoming. It's a place with beauty and ambiance. A place where jockey's, trainers and owners are treated well, but fans and bettors are treated just as well. A place where if you want to bet big cash with Maloney upstairs you can, but if you want to dress up in a suit and tie and bet $2 to show, well, you can do that too. 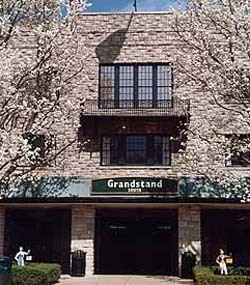 A place where you might see a Derby winner run, or you can own a claimer, with a shot to get to the winners circle, in front of fans, friends and family. A place where you can hope to get a decent table with your cohorts to handicap the races and shoot the breeze. Each year my Thursday evening before Keeneland's meet begins has me working at the real job. That allows me to play the next day's card, from start to finish, without interruption. It rarely works out that way, but that's my plan. Tonight will be no different. Today Keeneland was again named the number one track for betting value in North America by HANA. That has nothing to do with what I wrote above, of course. HANA's Bill Weaver, who designed the ratings, wanted them based on hard numbers regarding takeout, bettability, field size and all those metrics we worry about as bettors; not about how we feel about something. But it does give me hope that the sport we're all married to in some form can attempt to succeed on all fronts, to all types of participants and customers. When that's achieved, it helps the sport, and everyone's light shines a little brighter. I don't think anyone does it quite as well as Keeneland does. This was a timely read. I leave Sunday for a week in Lexington. First time. Any suggestions from you or your readers? Cool! You're in for a treat. I'm hoping to get working on the card later tonight. With you heading there for next week you should be able to get the lay of the land. I find the poly can play pretty quick in the spring, so we should be able to see what's what this weekend. I've got to through a pile of trainer stats. I can pass some along here later on. Cheers, and have a nice time. Thanks. If you have any restaurants, clubs or distillery tours to tout I'm looking for suggestions in those areas as well. @Kyle I'd recommend the Buffalo Trace and Woodford Reserve distillery tours. For restaurants I like Jonathon's at Gratz Park for elegant and Atomic Cafe for fun. I also highly recommend calling up and seeing if you can get out to some of the stallion farms for tours. Three Chimneys and Adena Springs are always very accommodating and the new WinStar Farm stallion complex is out-of-this-world awesome. I work at KTA/KTOB so feel free to call me at 859-381-1414 next week for more suggestions. Enjoy your visit! Thanks Melissa. That was helpful I wasn't sure what farms were open for tours this time of year. We're staying off of Versailles Road between the track and the city so not too far from Three Chimneys and Winstar I guess. I stay downtown and the first time I did, I left for the track around noon, expecting (like at every other track I attend) that would be more than fine. I'm glad your staying nearby. If they have a shuttle you're gold! I can see Hana giving Keeneland a good rating , but not sure why they rate woodbine so low considering above average pools, low signal rates which in turn make for large rebates, better than keeneland in fact and a similar polycrap surface. It's a little baffling. There's a pretty big difference between the two joints. KEE exotics can pay something like 20% more than Woodbine's. Last year KEE had one more horse per race too. I guess I would look at it like this: One place serves better food for $8 a plate, and one place serves worse food at $10 a plate. I am not really surprised KEE would be highly ranked over Woodbine. Some good nuggets of information from Jeremy Plonk on today's card. i don't know much about the food, I'm speaking from a bettor's perspective, I didn't say Keeneland should be rated lowly, but as a bettor, big rebates and decent fields are pretty good reasons to bet, I'm saying woodbine should be rated higher than nyra, santa anita, and a slew of tracks it's rated behind, that's all.Even small bettors can get really large rebates at woodbine. Late to the party but I'll 2nd Melissa's comments. Woodford Reserve is my favorite distillery to visit and right in the middle of horse country (near Coolmore). I'd also look into taking a drive down Old Frankfort Pike out to Midway. Great scenery and you can stop at Wallace Station for sandwiches on the way. If you're staying downtown, I'd recommend the Village Idiot and Shakespeare & Co for a good meal. Hope this helps and have fun. It's the perfect time of year. If you are staying in Versailles you should drive into Midway for meals/drinks/light shopping. Second Melissa's W. Reserve recommendation. For something really casual Ramsey's is great food with delicious pies for dessert. Thanks everybody for your recommendations. We were able to set up a tour at Three Chimneys. We'll definately be visiting Woodford Reserve and maybe Buffalo Trace. And I'm sure we'll take a ride out to Midway. We have three days to explore then four days at the track. Thanks again.